Visiting far-flung locations to play golf for the benefit of readers is a tough life, but someone has to do it. So when Paul Trow was invited to Mauritius for the fourth time in 25 years he was quick to say ‘yes’. What is it about Mauritius? The dodo, its flightless national bird, has long expired; sugar and tea, its traditional agricultural products, sweeten the coffers less as each year passes; and textiles, its other historic source of income, can now be stitched up anywhere. Yet this isn’t just anywhere. It’s half a day’s flight away and a four-hour time zone ahead – a combination that invariably delivers a hint of jet lag on the first night. The cost of just a week’s escape from Blighty leaves little change from £4,000. But the 140,000-plus visitors from the UK this year, many of whom see Mauritius as an idyllic, once-in-a-lifetime destination, couldn’t care less. They have eviscerated their bank accounts in order to indulge themselves fully in the Indian Ocean’s version of paradise. And who can blame them? Ringed by turquoise-blue sea, mint-green coral and gleaming white sand, this gloriously fertile island radiates enough colour to put a kaleidoscope’s spectrum to shame. Measuring just 40 miles from north to south and 28 at its widest point, it is home to hundreds of varieties of trees. Some are indigenous but many were introduced. Red flames and purple jacarandas were in full bloom during our all-too-brief November visit, along with the more perennial Banyans and palms. The cuisine is an enticing blend of Indian, French and Chinese influences, spicy without being too hot. Among the highlights are chicken, wild boar sausages, a bewildering variety of fresh fish and cornucopias of fruit. Accommodation is mainly five-star, certainly in terms of architectural style, warmth of welcome, sumptuous fare and attention to detail, so it is no surprise that tourism is now established as the island’s primary revenue stream. The native population, 1.26m at the last count, is cheerfully rising above the poverty line thanks to a healthy 5% annual growth in tourism (2017 delivered a record 1.34m visitors). French, German and South African tourists are also heading for Mauritius in similarly increasing numbers, but overcrowding doesn’t seem to be an issue with the resorts and hotels because the influx is spread fairly evenly across the whole year. To keep pace, the road network, clogged up a decade ago by 10mph tractors, carts bulging with cane and rickety push bikes, had to make a swift transition from the dark ages to the 21st century. The freshly-surfaced highways that now circumnavigate the island and lead in and out of Port Louis, the capital, show this has largely been achieved. Typically tropical, the climate in Mauritius is hot but not boiling, though it can be capricious. There’s always a trade wind in the air, though humidity is a constant factor and rainfall almost a national industry at twice the UK’s annual figure. Most of it drops from January through March when cyclones are also liable to breeze through. Inasmuch as there are recognisable seasons, November through April is regarded as summer with daytime temperatures rarely dipping below 28°C, while between May and October the average is 17-23°C. Mauritius has been in demand for more than a thousand years as a strategic naval and trading outpost. It was uninhabited until discovered by Arab sailors in the 10th century. The Portuguese used the island as a stop-off en route to the Far East during the early 1500s, but it wasn’t colonised until the Dutch settled a century later and named it after Prince Maurice van Nassau. The island was claimed by France in 1715 and eventually came under British control 200 years ago, after the war with Napoleon. Slaves were imported from Madagascar to tend the plantations, but when slavery was abolished in the 1830s many workers were brought in from India, thus establishing the cultural diversity that characterises modern Mauritius. The official language is English though French is also taught in schools. Meanwhile, the majority Indian community speaks mainly Hindi or Bhojpuri along with Creole, a popular mishmash of pidgin-French and local expressions that, bizarrely, seems not to contain any verbs. The religious mix is varied with Christianity, Islam, Hinduism and Buddhism all prominent yet content to co-exist. Throughout 2018, Mauritius is marking its 50th anniversary of gaining independence, becoming a parliamentary democracy and joining the Commonwealth with multiple celebrations that will embrace every facet of the island’s life. 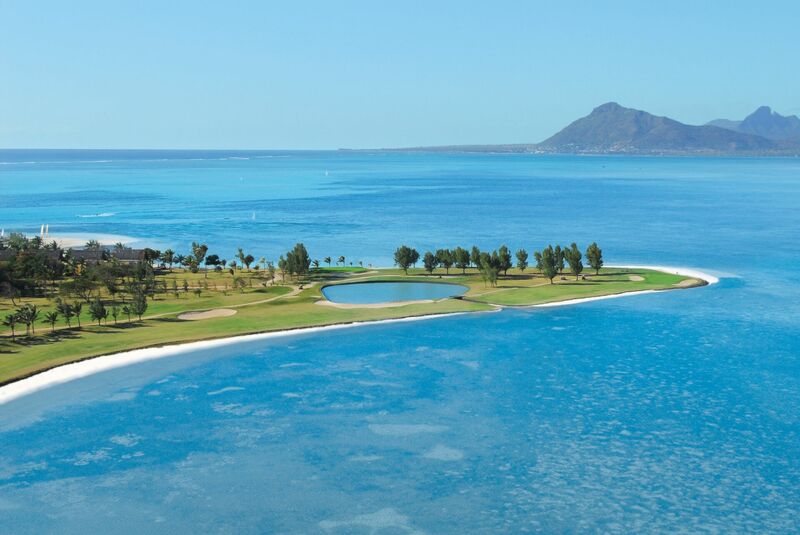 At the forefront of Mauritius’ accelerating tourism drive is golf, which, unlike the dodo, is alive and positively soaring. Before the 1990s, the only concession Mauritius made to visiting golfers came via two rather basic nine-hole courses – the Gary Player-designed Le Saint Geran on the east coast and Maritim near Trou aux Biches in the north-west. Inland was the 18-hole Gymkhana Club at Vacoas, a colonial legacy dating back to 1902 which, while open to visitors, was and still is predominantly a members’ club. The golf-tourism initiative teed off in earnest about 25 years ago when tons of volcanic rocks were shifted on the east coast to shape the fairways and ubiquitous water hazards of the Legend layout at Constance Belle Mare Plage. This initial creation, by the South African golfer Hugh Baiocchi, was so successful the resort then hired Peter Alliss to consult on the design of its second 18 holes, the Links, which opened in 2002. The Legend has staged a significant professional tournament every year since 1994 – first the original Mauritius Open which was wound up in 2008, and then the European Senior Tour’s season-ending MCB Championship which has just taken place for the tenth time. Having flown through the night with BA from Gatwick, our party of golf journalists landed at 6.30am, local time, at the polysyllabic Sir Seewoosagur Ramgoolam International Airport, named after the first prime minister. Hosted by the Beachcomber group, which has been in business since 1952, we stayed at two of its eight resorts – Paradis in the south-west and Trou aux Biches in the north. We also dined at Dinarobin, a Beachcomber hotel next door to Paradis, and lunched at the beachside Canonnier resort close to Trou aux Biches – both delicious experiences. Bleary-eyed but luggage-intact, we were driven to Paradis from the airport for an early lunch before partly retracing our steps to Bel Ombre on the south coast for our first tee time – at Golf du Chateau on the Heritage Le Telfair resort. I had played there twice before – a dozen years ago when the course, carved from a hillside sugar plantation by designer Peter Matkovich in 2004, was distinctly raw, and then five years later when its appearance was more refined. Now it’s a delight to behold and approaching full maturity. Featuring wide, undulating fairways, and large, sloping greens protected by a plethora of water, sand and African elephant grass, the course presents many tricky elevations and blind approach shots. Two of the 37 rivers that divide Mauritius up like a patchwork quilt, Citronniers and St Martin, meander slyly across the property, often turning up in unexpected places. This photogenic course was recently showcased to TV golf fans when it staged the AfrAsia Bank Mauritius Open – a joint venture between the professional Tours of Europe, Asia and southern Africa – for the second time in three years. Of additional interest is that Matkovich will return shortly with fellow South African Louis Oosthuizen, the 2010 [British] Open champion, to fashion the estate’s second, and the island’s 11th, 18-hole layout. Paradis Golf Course, alongside the Paradis and Dinarobin hotels on a 300-acre peninsula, was designed in 1992 by another South African, David Dutton, as a faux links, totally exposed to the wind. Several holes either run alongside the sea, like the spectacular par-5 16th (overshoot the green and the next stop is Madagascar), or across the inlet which almost turns the peninsula into an island. Our round on the second day, 24 years after I’d previously played there, convinced me it is now a parkland course by the sea. This transformation was due to some modifications made by Zimbabwean golfer Tony Johnstone in 1997, but also to the maturing of the stone pines and palm trees that frame its narrowing fairways. Towering 1,824 feet above the complex like a vigilant schoolmaster is the basalt Le Morne monolith which, to some eyes, resembles Rio de Janeiro’s Sugarloaf Mountain in miniature. After much campaigning, the whole area was designated a UNESCO World Heritage site in 2008. Despite the proximity of the mountain, though, the course itself is almost totally flat and easily walked. Once your round is over, it is only a short stroll to the sanctuary of the two Beachcomber hotels and their numerous bars, restaurants, beaches, spa treatments and swimming pools. And for those with energy still to burn, there are six floodlit tennis courts on site. Our final day introduced us to the new course at Mont Choisy, which has been built by Matkovich on the site of a 200-year-old sugar farm owned by the wealthy Harel family. A half-hour’s drive north of Port Louis and a couple of miles from the Trou aux Biches and Canonnier hotels, this could well become the jewel in the crown of Mauritian golf. Its gently rolling fairways are lined with thousands of baby palm trees that have a lot of growing to do before providing Mont Choisy with championship-venue credentials. But the basic ingredients are in place and it is already a fascinating spectacle with its imaginative mounding, pervasive bunkering and snaking waste areas covered with black volcanic soil. Decorating the boundaries of the course are brick structures, chimney stacks and fermentation vats that date back to the property’s 19th-century plantation days. On the back nine are three memorable holes – the short, risk-reward par-4 13th where the fairway is split by a ravine yet the green is reachable for longer hitters; the long, straight par-5 14th which was once used as an airstrip; and the island-green par-3 16th. It was therefore a shame that, having been assured by the locals of a warm afternoon, our visit coincided with a catastrophic outbreak of unseasonal weather – icy wind and horizontal rain. Ever the pragmatist, I left my clubs on the bus and took in the course from the safety of a buggy. Even then I ended up soaking and shivering! Let’s hope Mauritius has one more invitation up its sleeve for me so I can return to Mont Choisy in more clement circumstances. Four other 18-hole resort courses have opened in the last 15 years and each is worth a visit if time permits, for aesthetic reasons as well as golf merits. They are Shangri-La’s Le Touessrok on Ile aux Cerfs and Four Seasons’ Anahita, both on the east coast and designed respectively by major champions Bernhard Langer and Ernie Els; Tamarina, halfway up the west coast (near the first of the island’s growing number of designer shopping malls), and Matkovich’s newly-opened Avalon Golf & Country Club in the south. Completing Mauritius’ golf roster to date is the 9-hole pitch-and-putt aimed at beginners at Beachcomber’s Shandrani resort near the airport in the south-east. On offer are permanent residency rights for any individual or couple (and their offspring up to the age of 24) spending at least $500,000 (£373,400 at the time of writing). The government understands that people might baulk at the idea of splashing out so much on a home so far away, so it is dangling an additional carrot that might appeal, especially to retirees – reside for a minimum of 183 days per year and enjoy the island’s personal income tax rate of 15%. Anyone taking up this offer will have plenty of opportunities to explore thoroughly the beaches, lagoons and reefs that we only fleetingly glimpsed through our bus window, and maybe even acquire a passion for activities like surfing, snorkeling, quad-biking, zip-lining or fishing. For those turning their attention inland, there is much to gladden any environmentalist’s eco-sensitive heart. The Black River Gorges National Park, for example, teems with rainforests, waterfalls, hiking trails and wildlife like the flying fox. Meanwhile, the attractions in Port Louis include the Champs de Mars horse racing track, the Eureka plantation house and 18th-century botanical gardens. Hyperbole, yes, but not too much of an exaggeration! Get there: Air Mauritius flies out of Heathrow three or four times a week; British Airways flies out of Gatwick five times a week; Thomson flies out of Gatwick once a week. Currency: Mauritian Rupees (currently 43 rupees = £1). Tipping: Neither expected nor mandatory, the recommended amount is 50-100 rupees. Electricity: 240 volts with UK-style 3-pin plugs, no need for an adaptor.